Graphic geeks love to scan things. There’s something satisfying about capturing an archival quality image of a printed photo, newspaper clipping, fabric or other cherished keepsake. These days it may seem quaint to use a desktop scanner to capture images, but there’s many creative and archival tasks that only a desktop scanner can perform well. And thanks to recent advances in optics and electronics, you don’t need an expensive desktop-hogging monolith to get great results. Heck, today’s $70 scanners—say, Epson’s Perfection V19 and Canon’s LiDE120—aren’t much bigger than your laptop and they do an incredible job. They get their power through the same USB cable they use to send data to your Mac (no power brick), which makes them ideal for pulling from a drawer or shelf when a scanning opportunity arises. 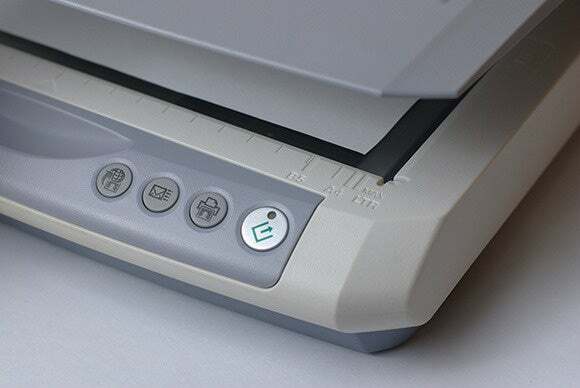 In this column, you’ll learn three great reasons to own a desktop scanner. Owning a scanner is mission critical for family historians. While relatives may hesitate to let you walk (or fly) away with their prized photos and documents, they’ll rarely object to you scanning them right then and there. Both scanners mentioned above are light enough to tuck into your bag when traveling. Another important scanner feature for family detective work is an expandable or removable lid. That way you can scan book pages without tearing them out (and quite possibly, reducing your inheritance). Scanning yearbook pages is just the ticket for Throwback Thursday—just be sure to enable the descreening feature in your scanner’s software to avoid the moiré pattern that occurs when scanning a photo from a printed publication. You can even use Preview to highlight yourself in photos you scan. While you’re feeling nostalgic, try scanning old concert tickets, theater programs, or even cover art from a favorite CD or cassette to share with online friends—doing so can provoke powerful memories! 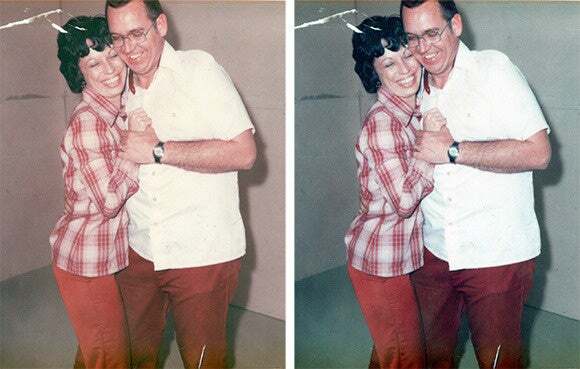 When scanning old photos, give your scanner software’s color restoration feature a spin; it can work miracles on faded photos and even improve ones that don’t look faded (any photo more than a few years old has likely experienced some color shift). Even if you fancy yourself a Photoshop jockey, it’s best to use the scanner’s software to restore color, remove dust, and descreen images. Today’s scanning software does such a good job of restoring faded colors that you may want to reprint the image. This picture of your author’s parents was taken in the early ’70s. Textures and backgrounds are fun and easy to create with a desktop scanner. Try scanning fabrics, wallpaper, flowers, or even leaves (though you might have to clean the scanner’s glass afterwards). If you’re a parent, you might document your child’s life by scanning a baby blanket or article of clothing. 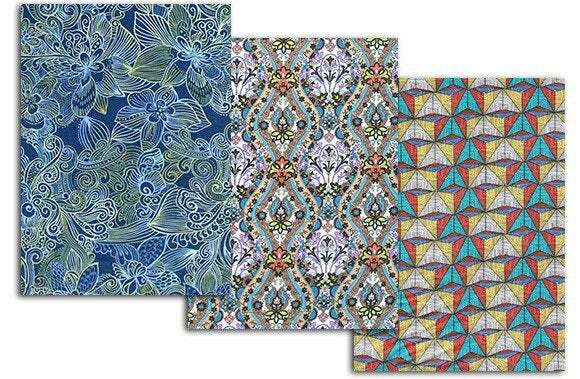 Fabrics make colorful backgrounds for creative projects. Be sure to experiment with your scanner’s color restoration feature to produce more vibrant colors. And scanning isn’t limited to stuff that’s flat. Keepsakes such as jewelry, pins, and other small objects are prime candidates for scanning, though you’ll get better results if you drape a black or white cloth behind the object before scanning it. Other fun stuff to scan includes postcards, newspaper clippings, report cards, awards, diplomas, badges, patches, and the aforementioned concert tickets and playbills. A scanner can often produce a more dramatic and detailed image of small objects than a camera. 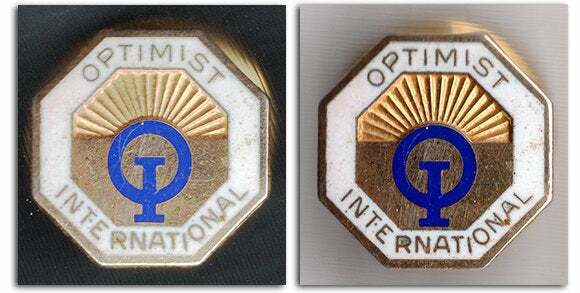 Here you can see the results of scanning a pin with a white and black backdrop. Resolution is the measurement that controls pixel size, and when you’re scanning for archival purposes, higher resolution is better—to a point. Just because your scanner can capture 4800 dpi (dots per inch) doesn’t mean you should scan everything at 4800 dpi; if you do, your hard drive space will vanish at warp speed. Instead, try this rule of thumb for photos: If you’ll print it at 100 percent, use 300 dpi, but if you’ll print it at a bigger size, multiply 300 dpi by the amount you’ll enlarge it. For example, if you’ll print the picture at 200 percent, scan it at 600 dpi (300 x 2), and if you’ll print it at 400 percent, scan it at 1200 dpi (300 x 4). If the item you’re scanning contains text, line art, charts, graphs, or other important sharp-edged stuff, scan it at 1200 dpi (our eyes can’t distinguish details at resolutions much higher than that). If you’ll print the item bigger than its original size, increase the resolution by the percentage you’ll enlarge it: if you’ll print at 200 percent, scan it at 2400 dpi (1200 x 2), and if you’ll print it at 400 percent, that’s when the full 4800 dpi resolution of your scanner comes in handy. If you’re posting the image online, you don’t need nearly as much resolution—one-fourth of the above numbers are fine for online-only viewing. As portable as some scanners are, they’re still fragile. If you’re traveling with one, don’t shake it and never put it in checked luggage. When it’s time to clean your scanner’s glass, don’t use a paper towel unless you want to spend the rest of eternity brushing away lint. Instead, use a lint-free cloth. And don’t spray glass cleaner directly onto the glass either; liquid has a nasty habit of seeping down the edges into the scanner’s mechanism or worse, onto the underside of the glass where you can’t reach it. Instead, spray glass cleaner onto a lint-free cloth and then wipe the glass with it. Until next time, keep scanning, and may the creative force be with you all!